DPR Home Improvements have over 25 years in home improvements providing conservatories and double glazing in Dorset & Hampshire. Choose your new & replacement windows, doors & conservatories at their showroom or on a Home visit. 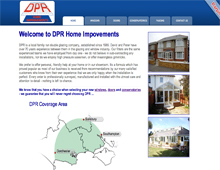 DPR are a friendly family run double glazing company who do not employ high pressure salesmen. Double Glazing Repairs including UPVC misted window repair, broken handles & seal replacement.